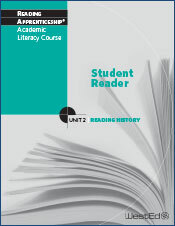 Unit 2: Reading History of the Reading Apprenticeship Academic Literacy Course introduces close reading of a range of history texts and genres. Readings focus on the topic of “rights,” and especially the women’s suffrage movement in the United States. Students continue to practice literacy skills introduced in Unit 1 and add new strategies related to the reading of history texts specifically. Included with the Teacher’s Guide are Iron Jawed Angels (DVD) and a large timeline to be developed with the whole class. 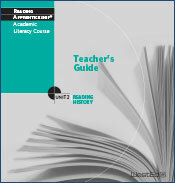 The Unit 2 Student Interactive Notebook for the Reading Apprenticeship Academic Literacy Course contains writing prompts, graphic organizers, and resources for partner, small group, and individual literacy investigations. The Student Reader accompanying Unit 2: Reading History of the Reading Apprenticeship Academic Literacy Course introduces students to a range of history texts, including expository text, journalism, essays, and first-person narratives focused on the topic of "rights," especially the women's suffrage movement in the United States.